This cute idea came from my friend and fellow SU Demo Maggie Quack! www.maggiequack.de She has a very lovely clean but innovative style. It is worth having a look! 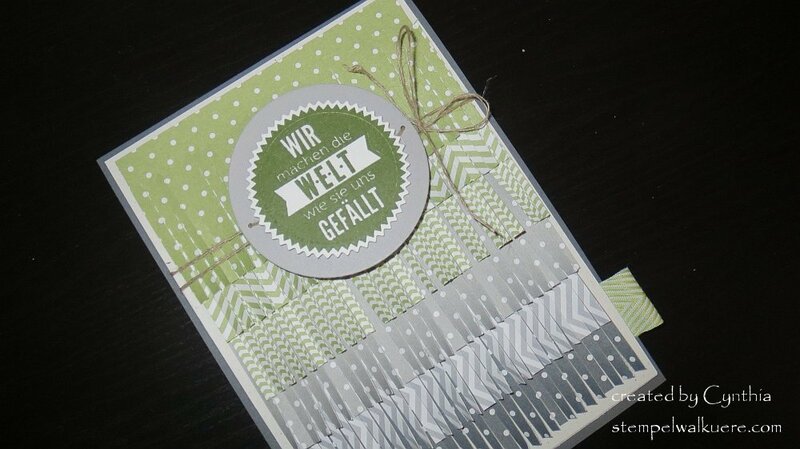 😀 This card is a result of the scraps from a larger and more impressive project which she created for a terrific creative presentation with more that 15 different pieces made with Stampin‘ Up products and lots of „Reloved“ items. Her creative table deservingly received the 1st prize at our team meeting at the end of August. This project really caught my eye and I wanted to try it out immediately! So I did! The larger project from which this card was born is a real creative brain storm, which I also reinterpreted in my own color scheme. Keep you eyes pealed and stay tuned!